Watching the deterioration of a loved one with Alzheimer’s and trying to communicate with them can be heartbreaking. That once vibrant individual doesn’t seem to be the same person. The first and most important tip to know when speaking to your loved one is – they are still there inside. 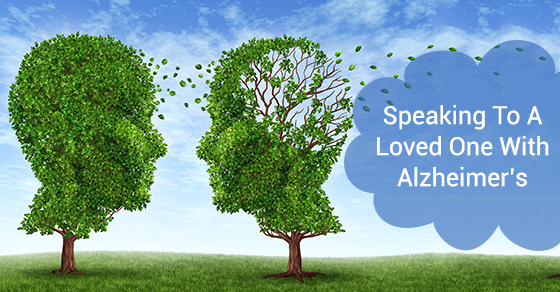 It doesn’t matter where they fall on the Alzheimer spectrum, communication is possible, and they are yearning for it. If you are struggling with Alzheimer’s home care in Toronto, let us give you some valuable tips for speaking to a loved one with Alzheimer’s. This is one of the toughest communication skills to develop as you care for your loved one. Don’t try to finish their sentences. Wait for them to remember or find the right words. At the same time, don’t interrupt. Give them the time to complete their thought or request. This is another difficult task for both you and your loved one. Maybe they like to initiate the disagreement, but don’t get sucked in. Arguing will only cause more anxiety for them and frustration for you, the caregiver. Change the subject or distract them from the topic. Get to eye level whenever possible when you are speaking to them. It shows your loved one you think they are important and you care. It is easy to talk over them or around them, like they’re not there, when communicating with others. Don’t make them feel like they are not really there. In certain situations it could be best to use non-verbal signs to communicate. Your smiling face and reassuring looks can do wonders for a loved one struggling to communicate verbally. Never underestimate the value of your touch and accepting demeanor. If you are involved in Alzheimer care in Toronto, eliminate as many distractions as possible when communicating with your loved one. Turn off the tv, sit down, and make sure only one person at a time is talking. It’s OK to laugh sometimes. There are times a situation just begs for a laugh. Just remember to laugh with – and not at them. When this writer’s mom with dementia had difficulty remembering a name or a recent situation, she would always say, “I have a good memory, but it’s short.” She would then let out a hearty laugh and we would too. It was her way of coping and it helped us too. Make it as easy as possible for your loved one to respond. Instead of asking “What do you want to eat?” ask “Are you hungry now?” Yes or no questions are easier. Avoid baby-talk. It can be demeaning and even cause anger and resentment. Alzheimer home care in Toronto is a challenging task.